Chris’ What if film history DID start with STAR WARS? At Christmas 1991 I sat down to watch my first foreign language film, it was Roger Vadim’s “And God Created Woman”, perhaps Bridget Bardot was the main attraction, but I didn’t think much of it. Over the coming months I watched Werner Herzog’s “Aguirre, Wrath Of God”, Ingmar Bergman’s “Through A Glass Darkly” and the 1978 French film “La Cage Aux Folles”, I wasn’t that impressed with any of them to be honest. I thought subtitles perhaps weren’t for me, so it was make or break time. Summer 1992, Sunday evening Alex Cox showed “Les Diaboliques” in Moviedrome following the premiere of Spike Lee’s “Do The Right Thing”. Alex Cox said “If you sit all the way through this, you will be scared”. Henri-Georges Clouzot had made his name for himself the previous year with “The Wages Of Fear”, the tale of four drivers down on their look who must transport some nitro glycerine, I watched it a couple of weeks ago and it is still a very intense, brilliant film, but I think his masterpiece is this film. It tells the tale of a headmaster (Paul Meurisse as Michel Delassalle) at a boys school whose wife (Vera Clouzot as Christina Delassalle) and mistress (Simone Signoret as Nicole Horner) plan to kill him. When they do, they put his body in the swimming pool, the swimming pool is drained to be cleaned, there is no body. His dry cleaning keeps appearing, there are sightings of him throughout Paris, could this all be too much for his wife with a weak heart? Charles Vanel as the Police Inspector Alfred Fichet is excellent at trying to solve the mystery, he had played one of the truck drivers in “The Wages Of Fear”. It became a massive box office success. After this he made a documentary about Picasso “The Mystery Of Picasso”, he had known Picasso since he was 14, but hardly anybody saw the film and he struggled with the coming of the French New-Wave. He did make “La Verite” in 1960 with Bridget Bardot which was massive at the box office and was Oscar nominated, but it was tinged with sorrow, his wife, Vera Clouzot, who had been struggling with a heart condition, died of a heart attack, aged just 46, mirroring her character in “Les Diabolique”. Heartbroken, he never really worked properly again, passing away himself in 1977, aged 69. The film was remade with Sharon Stone and Isabelle Adjani in the 90s and from what I am told, it is awful. 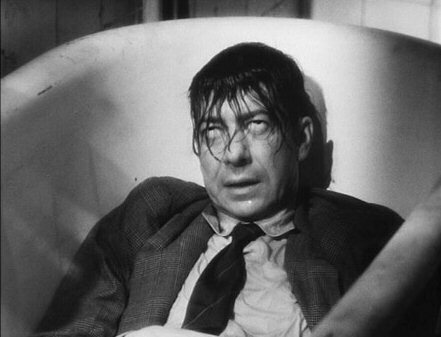 The original still succeeds, a superb thriller that is up to the best of Hitchcock. Everyone I have shown this film to has agreed that it is one of the best of all French thrillers, in fact one of the best films of the whole of French cinema. ← Dirking About … nothing on. a finest web page for hottest updates. The Dirk Malcolm Alternative is a site of film lists and memories. Written by Dirk Malcolm (Chris), Roof-Dirk (Andy) and Dom-Dirk (Dominic). Dirking about ... How do you view?